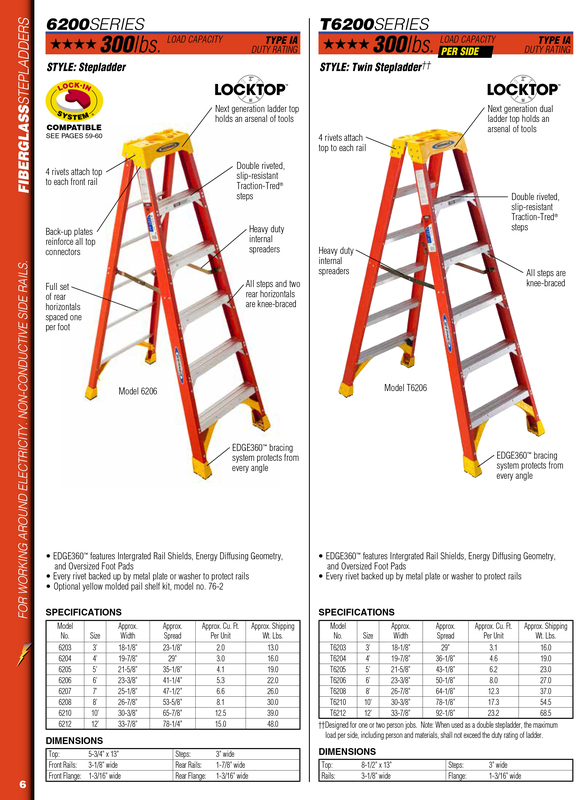 Werner 6200 Series Fiberglass Stepladder | 300 lb Rated - Industrial Ladder & Supply Co., Inc. The Werner 6200 Series Stepladders are design for professional contractors and industrial users. With a duty rating of 300 pounds, this series features a HolsterTop with the Lock-In System to secure tools from falling while keeping them right at hand. These ladders offer a full set of rear horizontals and heavy duty internal spreaders. All steps are knee braced and the foot pads are riveted to the EDGE® structure. The EDGE bracing system helps protect the rail from damage. Each TRACTION-TRED® step is slip resistant and double riveted. Fiberglass rails are non-conductive for working near electricity. This is a sturdy well designed ladder that is stable and easy to move. Great deal. Light and easy to move. Very stable when opened. Priced lower than comparable ladders at other retailers. I am very happy with the delivery and this purchase. This is a great ladder at a great price. I bought it for general use around the house. 8 ft. gives you that extra height that seemed to always be missing with a 6 ft. I own a 20 ft Werner extension that I also bought from Industrial Supply. Both are sturdy and well made. I highly recommend both Werner an Industrial supply.